In an effort to improve our backyard, I have been frequenting Home Depot's Garden Center. 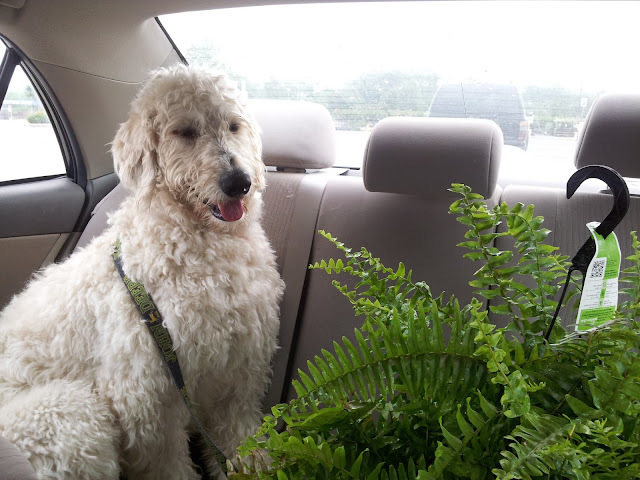 I thought Milt looked pretty darn cute sharing the backseat with this big, 'ole fern. He actually ate a lot of the leaves on the way home. See how he was eyeing it! I guess Milt just wanted to take advantage of sitting unsupervised in the back -- mischievous puppy. He's trying to make it look as if he's ignoring the plant just waiting for you to turn back around and not notice him munching on it. LOL What a ham!